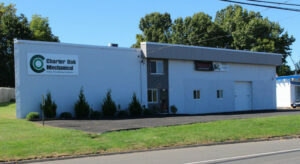 Charter Oak Mechanical installs residential air conditioning systems in the greater Hartford Connecticut region. As a heating, cooling, and ventilation contractor serving the area for over 25 years, thousands of satisfied customers have improved their home environments with our help. Southern New England weather is variable and temperatures and humidity can reach extremes. Having a central air conditioning system installed in your home ensures quiet comfort throughout the house no matter what the weather is doing. Is your home unable to handle ducts? We have ductless cooling solutions for the antique structures may not easily accommodate a duct system. Ask about Ductless Mini Splits. The Charter Oak Mechanical staff is knowledgeable and professional. Not only will we install your air conditioning system, we will keep it running smoothly for you. The Charter Oak Mechanical Guarantee states that if you are unhappy with your Home Comfort System’s cooling or heating and we can’t fix it, we will remove the equipment we installed and refund 100% of your original investment at any time during the first year. When you need an HVAC contractor that serves Rocky Hill CT and surrounding town and you want the Best – call Charter Oak Mechanical at 860-432-8915. Charter Oak Mechanical has been accredited by the Better Business Bureau.